Many inkjet printers use multiple ink cartridges that must be changed depending on what type of printing is taking place. For instance, many HP inkjet models have normal HP ink cartridges and photo cartridges. When printing photos, one of the original cartridges must be removed and replaced with a specialty photo cartridge, then the process is reversed for normal printing. While many users may switch back and forth every day, some may only switch to photo printing very rarely. If an ink cartridge that has been opened sits unused for too long, it can dry up when not in use and may not work properly. 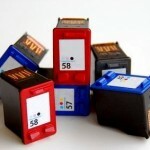 By properly storing open ink cartridges, however, you can prolong their life. The best way to keep a cartridge from drying it out is to store it in a sealed container with a source of moisture. Follow these steps to store your cartridges properly. Use a moist cloth to very gently wipe the heads of the cartridge to remove any excess ink. Use a strip of vinyl tape such as electrical tape to cover the printing heads. If the cartridge has multiple heads, make sure each is properly covered. Wet a small cloth and wring it out so it is only slightly damp. 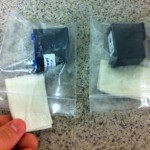 Place the cartridge and cloth in a zip-sealed sandwich bag or a resealable plastic container. Seal the bag or container. Place the bag or container in a cool, dry location out of any direct sunlight. Check the moisture of the cloth every few days. If it isn’t damp, re-moisten it for best results, then reseal the container. While these extra steps may seem like a lot of work, they can mean the difference between a usable cartridge and one that requires a costly replacement. 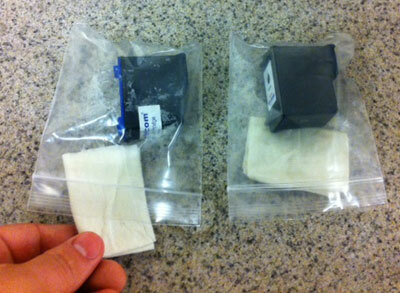 By better maintaining your open ink cartridges, you can save yourself a lot of money over the course of a year. Taking proper care of your printer is just as important as taking care of the cartridges, so see our article on Prolonging the Life of Your Inkjet Printer for helpful tips.